how much he is loved? From Closer to the Ground (Main Street Rag, 2014). 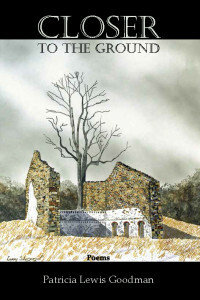 Patricia L. Goodman is widely published and a 2-time winner of the Delaware Press Association's Communications Award in poetry. A graduate of Wells College, she has a degree in Biology and is a member of Phi Beta Kappa. Until his death, Patricia and her husband bred and trained horses on their farm in Chadds Ford, Pennsylvania. She now lives in Delaware, on the banks of the Red Clay Creek, where she is surrounded by the natural world she loves. Beautiful. Touch so powerful. He remembered. I like these short and sweet poems. He will remember. The subconcious knows. most underrated touch: holding hands. . ..